Two of Scotland's biggest salmon producers say they have made a breakthrough in the rearing of so-called cleaner-fish to tackle sea lice. Until now, most of the wrasse used in salmon cages have been taken from the wild, which has caused huge concern among environmental groups. But researchers say they have been able to "complete the life cycle" by rearing their first brooding stock. They hope to become self-sufficient in the fish within the next three years. Cleaner-fish, such as wrasse or lumpfish, live in the same cages as salmon where they attack and eat parasitic sea lice. Only small numbers of farmed wrasse have so far been deployed in salmon farms, with the majority coming from the wild. The industry estimates that up to 1.2 million of the fish will be needed to service all of Scotland's fish farms. It has taken six years to breed wild-caught Ballan wrasse to the point where their offspring are themselves reproducing. Marine Harvest Scotland and Scottish Sea Farms, which have jointly funded the project, say they believe it is a world first. Hatchery manager for Marine Harvest, Paul Featherstone, said: "Ballan wrasse provides highly effective, highly natural sea lice control and as such is in huge demand. "With this breakthrough, we now have proven procedures for breeding, weaning and rearing wrasse, which will both help ensure farmers have a more secure, controllable supply and reduce reliance on wild stocks. "Over the past three or four years we have been putting out fairly small quantities of farmed wrasse and they have been working very well. "We've developed techniques now to completely close the farming cycle." Campaigners have long been concerned with some of methods used to tackle sea lice, including shock treatment where the fish are bathed in warm water so the parasites fall off naturally. Errors in the process have led to entire stocks - hundreds of thousands of fish - being killed off. The use of chemical medicines in the cages has also been criticised. Scottish Sea Farms' head of fish health, Ralph Bickerdyke, said: "These landmark breakthroughs are the result of many years of collaborative research, involving a significant investment of time and money by farmers and academic partners intent on developing natural solutions to the control of sea lice. "Biological control with cleaner-fish is our preferred option because it is on the back of our overwhelming prevention strategy for sea lice. "But we will still require the availability of tools such as delousing technologies and other alternative methods, including veterinary medicines, when required." The environmental group Open Seas has criticised the process of removing wrasse from the wild because of the potential to damage stocks. The fish are a slow-growing species and the charity is concerned that they would not recover quickly enough if they were over-fished. Nick Underdown from Open Sea said: "They are nowhere near producing enough wrasse to deal with the problem and in the meantime we are hoovering up our wild wrasse stocks, wiping them out, and there are no precautionary measures put in place to manage this fishery. "That is no way to manage a fishery. All we have got is a voluntary code of conduct with no stock assessment and no science." Sea lice live on the outside of the salmon and can cause significant damage to their skin. They can also be passed to wild stocks if they swim close enough to the edge of the cage. The industry believes it is getting on top of the problem with numbers at a five-year low. 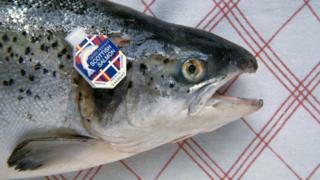 It has also begun publishing details of the farms which have the highest concentrations of sea lice. But Salmon and Trout Conservation Scotland says the data is not being made available quickly enough and that historical data should also be published.